Marshall Brewing at Gravity Brewing in Louisville, CO. Photo by Rachel Dugas. Tomorrow brewers from across the country and some 2,000 beer lovers will land in Denver for the third appearance of Collaboration Fest, presented by Two Parts (formerly Imbibe), which will feature creative concoctions of brewer collaborations, with the only criteria that one team member from each collaboration hails from Colorado. This is an opportunity for brewers to hang out with other brewers, to drink beer and to ponder the world of craft brewing while joining forces to create one-of-a-kind brews exclusively brewed for this festival. (Many will hold special release parties to share the beer with their taproom patrons). 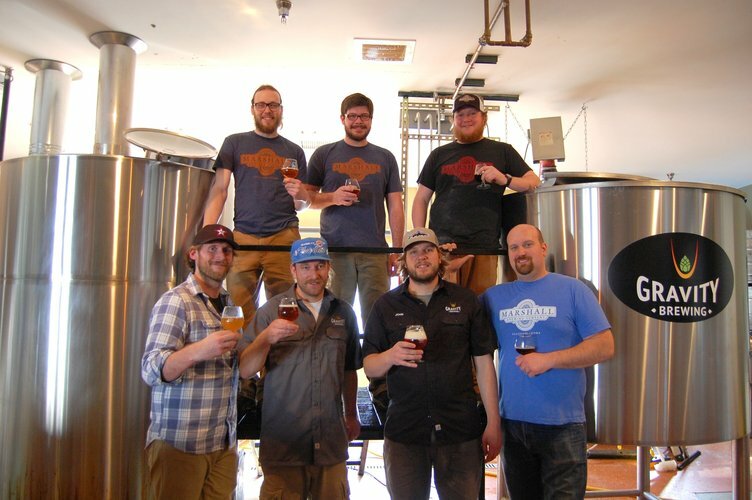 Collaboration Fest is the kickoff event for Colorado Craft Beer Week, which starts runs March 19 through 27, and will highlight the state’s best craft beer at various locations. Collaboration Fest was created in partnership with the Colorado Brewers Guild, and is sponsored by Falling Rock Tap House and Star Bar. In addition to sponsoring the event, they also created a collaboration beer with New Belgium for the festival. Unfortunately to procrastinators, the festival is already Sold Out; however, unauthorized ticket barkers will likely be an option if you are desperate to taste what the brewers have come up with. Here is a photo gallery of some brew events that took place in Boulder last month. We can’t wait to sample these and more great beers. Cheers!